IBT wants to work with you to design drag chain conveyor systems that meet all your specific business needs. Our knowledgeable team of conveying systems experts, in addition to the partnerships we’ve built with top manufacturers like Essmueller and Schlagel, will ensure that you receive quality service, parts, and ultimately, a reliable drag conveyor system to maximize your throughput. 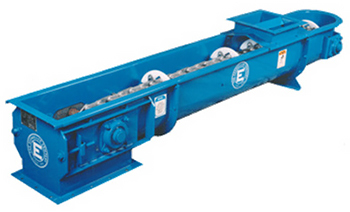 Drag conveyors have capacities from 1,000 BPH up to 60,000 BPH and can run horizontally or inclined with special applications, such as L-Path drag conveyors. Select from painted steel, galvanized or stainless steel, and either a round or flat bottom design. Standard features include: Steel or cast iron sprockets, external-mount pillow block bearings, 12 ga. metal trough, 14 ga. flat weather covers, stress-proof shafts, UHMW paddles mounted on heavy-duty chain and UHMW return rollers. Additional options available upon request, such as: thicker UHMW paddles, split hubs, roller chain, trough liners with UHMW or abrasion-resistant steel plates, bypass inlets, bend sections, discharge gates, safety monitor systems, rail returns, divided troughs or flame cut hardened steel sprockets. All component parts available for both flat and round bottom conveyors. We are able to match all existing types of chain for all conveyors (flat and round bottom) along with the ability to provide the specified attachment brackets with required fasteners. The UHMW flights are a top choice for the grain industry due to their strength and ability to withstand abuse in these demanding environments. Their durability has been proven time and again. The abrasion-resistant material has the ability to “flex and give” tremendously and less friction reduces the workloads on drives and motors, in addition to reducing the wear on flights and the trough. The white (virgin) UHMW flights are ideal for food handling due to their naturally slick surface and compliance with Food Additives Laws and Regulation No. 177.1520. They are an obvious choice with their low initial cost and longer operational life, minimizing downtime and, ultimately, saving you money long term, as well. IBT can design the grain drag chain conveyor systems that are right for you—depending on your site, the grain being moved, capacities, wear factors and feeding arrangements. Call us today for a customized quote! As specialists in the conveying systems field, IBT Industrial Solutions understands the importance of good systems application in achieving optimum efficiency. With our years of experience in providing conveying systems and components, you can rely on IBT for the best solution to your problems. Contact Jim Boatright, the Conveying Systems Business Group Director at IBT Industrial Solutions to learn more about IBT’s expertise in grain drag chain conveyor systems.